Ezmlm-idx normally installs with no problems. However, the p5-Ezmlm perl module will prompt you for the location of a few things. First, understand that the perl module is NOT required. It's only purpose is to be used with ezmlm.cgi. 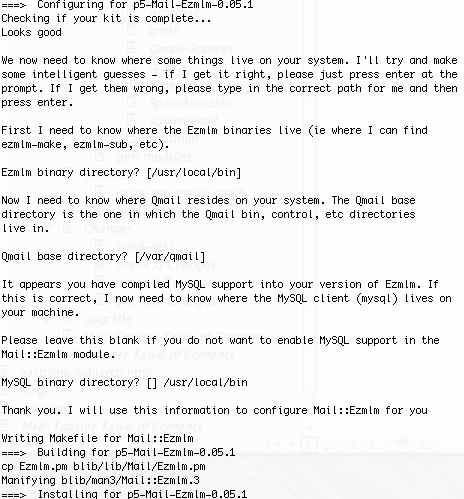 So, if you don't care about ezmlm.cgi, and the perl module won't install, don't worry about it. If you do want that feature, the following settings should work for you. If it fails, then it'll try again using CPAN instead. In every case I've ever seen, where the port install failed, the CPAN install worked.